Since I do not really eat meat or fish this post is a veggie review of Corner Burger (CBBG 76). I do think it deserves one. Among not too many places in Moscow offering interesting veggie food CBBG 76 is definitely worth attention. 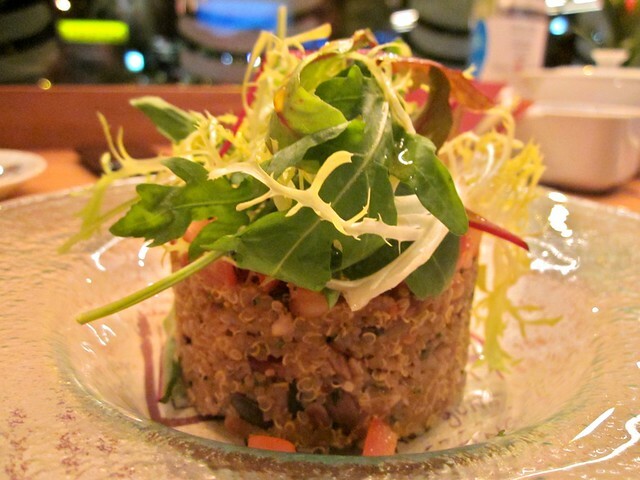 We went for Tomato tartar with quinoa – I was going to try it since I heard about it at Suki Maman class a cafe Sok. Eggplant fries with kim chi cocktail sauce looked really tempting too, but we decided to start small this time. The food made with so much care deserves respect. Then came the main thing on the menu – burgers. Many. With beef, chicken, turkey, duck, salmon… and finally the South beach veggie burger. For a moment I got distracted by the Caprese burger, but just for one moment. This is for the next time. I couldn’t go away without trying what I came for. It turned out that since the picture was taken the burger has evolved into this full blown veggie interpretation. “Why should vegetarians not have a 'traditional' burger in a bun stuffed with other tasty ingredients: salad, caramelized onions, that sauce stuff that is OH SO GOOD but gets everywhere and sticks to your fingers, a bit of cheese and a slice of tomato..." that’s what Suki said about the idea behind it. The tartar came soon. It was steamed quinoa - a grain now getting into fashion with mild taste and texture resembling couscous. Quinoa was mixed with delicious soft pine nuts, pumpkin seeds and some flavorful dressing, topped with fresh tomatoes and crisp green salad. While we were still enjoying the tartar, the South beach came. With fries, cabbage salad and even this amazing pair of ketchup and mustard in the proper wooden holder. The buns were grilled and had amazing crispy edge. They went great with the crispy slice of cheese and fresh tomato slices. The patty was delicious spicy, with several different flavors mixed together – mushroom, lentils and something else I didn't identify. When the burger was gone we saw it was exactly right to order one salad and one burger for the two of us. And once again we had no room for dessert left. So the blueberry pie, banana blonde and chili apple cheese cake together with the Caprese burger and eggplant fries will have to wait for the next time. I.e. I will have to wait. I hope not for too long. So I do that there will be more burger making classes by Evgeny Openkin, and that I will make it to the next one.